This is a Textile. It was designed by Wallace Sewell and made for Transport for London. We acquired it in 2018. Its medium is wool, polyester and its technique is pile woven. It is a part of the Textiles department. Moquette is a type of very hard-wearing, durable and fire-resistant fabric with wool pile which is frequently used in public spaces. TfL’s brief for the project was very specific in terms of durability and design: patterns had to have small repeats and bold patterns to mitigate the effects of wear and vandalism, and could use no more than four prescribed colors. 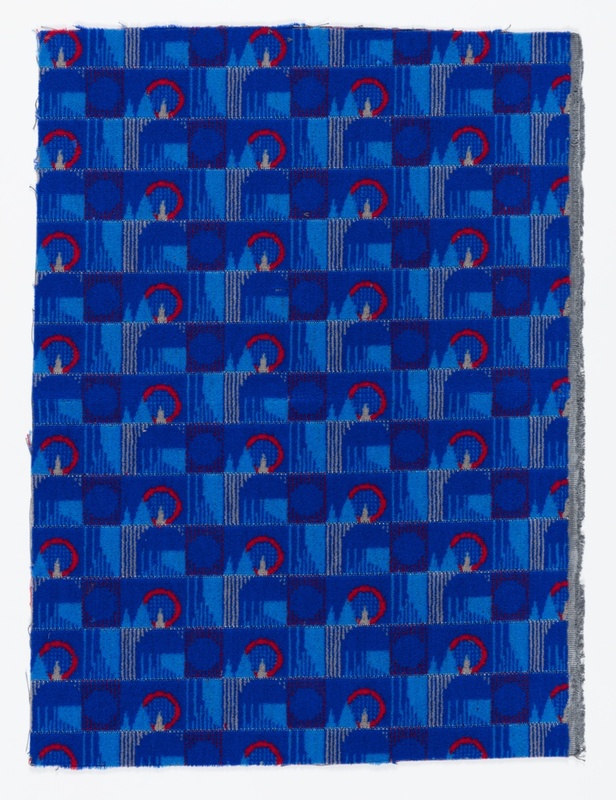 Richard Perry, the agency’s current commercial director, said “The standard was extremely high, but this unusual seating fabric – which is practical, attractive and economical – met the tight design brief on every level.”[i] Introduced in 2011, the blue colorway is in use on the Central, Jubilee, Northern, and City lines, while the gray colorway is used on the Bakerloo line. Wallace Sewell’s design is based on four iconic London structures -- the London Eye, Big Ben’s clock face, the towers of London Bridge, and the dome of St. Paul’s Cathedral – each abstracted to simple, geometric forms. The pattern was named Barman after Christian Barman, who commissioned the first moquettes for the Tube in 1936. As London Transport’s publicity manager from 1935 to 1941, Mr. Barman was one of the first people to think about seat upholsteries as a part of a cohesive brand identity. The London Tube has used moquettes continuously since the 1936, and Wallace and Sewell said it “had always been a dream and an ambition” to follow in the footsteps of Marianne Straub, whose designs were used on trains from 1969 – 78. This object was donated by Wallace Sewell.